It's our birthday month, so we're having a party all month long! The anniversary of the day we were made a 501(c)(3) is September 12th...but a month-long celebration is so much more fun than just a day, don't you think? Leave comments on this post all month long and be entered into a drawing for a prize at the end of the month - tell us what you're thinking about all the great challenges! With our recent blogger problems, and the need to test out a new blog template, we've got a master post at the top of our blog (this one) and it'll stay here with the growing list of challenges that get added. Be sure to check in daily to find out what's new! 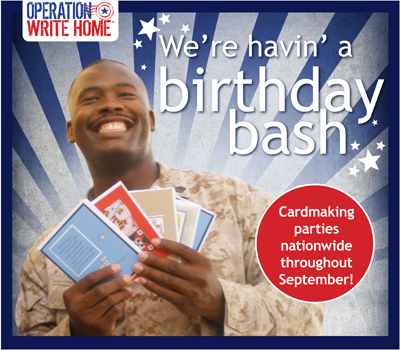 Mark our birthday weekend on your calendar too - we'll have a Virtual Cardmaking Party with challenges every TWO HOURS! Wooohoo! And now without further ado: our growing list of challenges! CASE the cardmaker! Right here on S&S...use the featured cardmaker's work as your inspiration and leave a link to your card in the InLinkz on the main post. ETA: Winner is Carol L! We R Keeping an Eye on You: Sponsored by We R Memory Keepers - make a card with brads or eyelets! The prize: a Cropadile kit! Miss You - Love You! Sponsored by Inspired Stamps - make a card for OWH with a "miss you" or "love you" theme throughout the month of September and upload it on the Inspired Stamps blog. There will be two winners of an Inspired Stamps acrylic stamp set of the winners choice! Sketch #85 - sponsored by K 'n K Designs! Illinios State Digi - if you win, you can pick which state gets bumped up on the list of states for their OWH digistamp! Dimensional Lattice Tutorial - fun! Autumn card challenge, sponsored by The Angel Company! I'm So Grateful challenge, sponsored by Through the Craftroom Door - you have all month to link up an AnyHero card or a thankyou card to qualify to win a year subscription - w00t! CASE the cardmaker! Right here on S&S - use KellyRae's cards as your inspiration! Tutorial - Fun Fold card! Christmas + ribbon challenge from May Arts! I got a few good days off so I am spending the time to play along with all the challenges. So far, they are way cool and I hope to get a whole box ready to go out in the next 2 weeks. Happy Birthday OWH!!! Thanks for putting the master list here! Maybe in a few days I'll be caught up and can start playing. Same blog - we had to try to fix things in the code because Blogger blew up our template; this one only partially works. Agh, html. If only there were more hours in the day to fix things. It's great to have the entire list in one place... makes it quick and easy to check in and to figure out if you've missed anything. I, too, love this masterlist list all in one spot. So far, I've been able to play along! Oh, have mercy! This was a bad time for my computer to give out. Am just catching up on things. I see I have quite a bit of catching up to do in challenges as well! I love the master list and hope I get to play along with some of the challenges this month and especially this weekend. Thank you all for the hard work that you put in. I miss the old blog style. It seems like there are so many posts and so many contests going on at the same time I don't know where to begin. When I post a link to one of my cards I'm not getting any viewers - they probably don't want to go back to the older posts. I sure am loving the inspiration though! Hi Everyone -- Thanks for a wonderful month of fun and inspiration. (52)new cards in a variety of themes, all stamped and tucked shipping out to Dixie tomorrow. PLEASE be sure to check out my BLOG CANDY too!! I have made over 500 cards with my group of cardmakers to donate through a near-by scrapbooking store, but I've never been to this site before. I'm so glad I found it because we can use the challenges to make many more! Thank you for doing what you do for our troops!